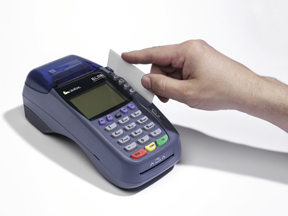 The Cleaning Card is essential to the consistent credit card and debit card reads on your POS Terminal. A credit card has oils and dirt on its surface. With every swipe into your credit card reader these contaminates are transferred into the card reader and onto the magnetic heads. This accumulation of dirt and oils is 80% of the reason why these readers fail. Every time a credit card transaction is manually entered the fees for that transaction are increased by as much as 2%. The increase in fees and the time it takes for an employee to enter the number manually are essentially eliminated for a fraction of the cost with regular preventive maintenance. The use of cleaning cards will prolong the life of the reader. Designed to thoroughly clean the reading mechanism for credit card readers. A regular preventative maintenance program will eliminate misreads and keep customers happy. Available in both flat and waffle styles. Designed to remove build-up and contaminants on the thermal printhead within the printer. Visit our partner site to obtain marketing material for the most comprehensive and complete overview of cleaning cards and other technical cleaning products.